In this digitally connected era everything from mobile phones to homes are smart. In this bandwagon, the term ‘smart warehouse’ does not come to us as a surprise. Smart warehouse is managing, controlling and getting real-time updates of all components of your warehousing operations. If we look around, we realize how frequently we are using automated systems. In fact, we have got used to them and cannot think of life without basic automation. The concept of automation and connectivity has crossed the limitations of time and space to make our daily jobs exponentially easier. Smart warehouse is the creation of integrated ecosystem where several components of warehouse work in coordination to increase the productivity and efficiency of the warehouse. This is the high level of automation where all devices of interconnected technologies reduce the human work by sending automatic alerts and recent updates on stocks and orders. The scenario at automated warehouse is completely different compared to manual one where workers are moving around with papers to update stock records, load products into carts and coordinate to ensure timely delivery to the destination. Whereas in case of automated or smart warehouse system, many of the tasks such as receiving of the goods, identifying, sorting and organizing happens automatically in the IoT and AI technology ecosystem. In short, all the operations of warehouse that require involvement of suppliers to customers can be automated with minimum human intervention. Related: What are the Immediate Benefits of Smart Warehouse? 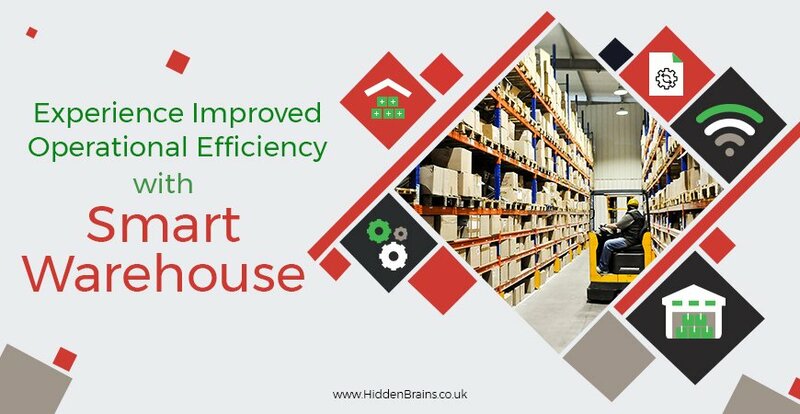 Establishing a smart warehouse requires initial investment in the form of purchasing smart devices, programming robots to function in the ecosystem and developing software that integrates all the warehouse tasks through the help of professional IoT application development company. Warehouse managers can know the exact location and track the progress of items through smart devices with radio-frequency identification (RFID) tags and sensors. With the use of integrated wearables, all the stakeholders can move around freely, access information from IoT application and give instructions from anywhere to control warehouse operations. Save on manual labor by investing in IoT technology that increases overall speed of warehouse operations and ensures everything goes smoothly in the supply chain. Warehouse managers can maintain complete transparency and visibility into inventory and supply chain to plan further activities accordingly. All the devices and system must be able to integrate and share information seamlessly over the ecosystem. Build an IoT system that supports legacy as well as smart devices to ensure smooth migration from traditional system to advanced one. Test this IoT system for its connectivity with all types of devices and applications. Establish systematic device management and security with different possibilities of application programming and analytics. Empower all stakeholders with the right kind of devices so that they can know what’s happening remotely through IoT application. It is high time for organizations to start using automation through the successful implementation of smart warehouse. If the initial investment for full-fledge smart warehouse seems too high and beyond budget, try implementing small piece of technology and later move ahead steadily for a complete revolution. Hidden Brains is a leading IoT solutions provider helping organizations to take a leap in the technology world with innovative, breakthrough products and solutions. We understand your unique business requirements and help you to step ahead by starting with small automation implementation. To know the prospects of IoT implementation at your warehouse or organization, request for an instant free quote now.